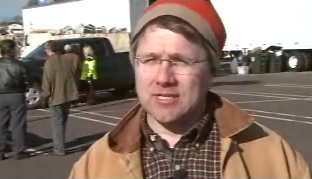 E-Cycling Day was recently included as part of an Alabama Public Television feature on green initiatives in our state. The entire show is available online from the APTV.org website. If you just want to catch the section on E-Cycling Day, start at the 26:27 mark. And for the record…uncontrollable laughter. That was the reaction from Apple of My Eye and Cute as a Button to the awesome Winter Hat of Justice I’m sporting.